Fives participated at the week of the Industry, from 20 to 26 March, to promote and enhance the industry segment. This event allowed students of a high school of Belfort to discover the jobs and the organization of an industrial company. Fives, opened its doors, to a Belfort high school, to introduce to students (Year 11/10th grade) , the industrial work and world. It was a unique experience for students! Indeed, they were able to visualize the technical and human means during the visit of the factory. They had the opportunity to interact with professionals of automation, mechanical and electrical engineering departments but also to discover different jobs with real career prospects. Fives' business sector wasn’t very well known to these students, they really enjoyed the demonstration of robots control programming and discussing with employees. Fives participated, for the project «Recognition of industry professions in Franche-Comté », in the Technological Industries Film Festival in the region. This year Fives Group welcomed students from a professional formation center in Exincourt (France) who shot their film in Fives Cinetic facility (Héricourt, France) and participated in this festival. "From design to sales, the sum of skills to manufacture an object in the Technological Industries". This theme was chosen for this 2016-2017 edition, to highlight the week of Industry. Film'It Awards #4 were awarded on Friday, March 24, 2017 during an official ceremony. 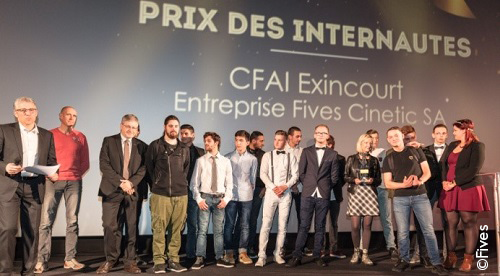 Among the 6 trophies that were awarded, the professional formation center of Exincourt won the web price thanks to a lot of “likes” for the film shot within Fives' company.